A perfect way to take the chill out of a winter’s evening is with a mug of Glogg, a Scandanavian mulled wine. 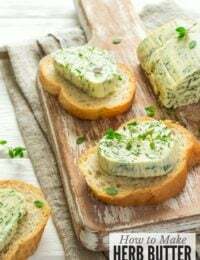 Easy to make, it’s brimming with warming spices and other surprises! 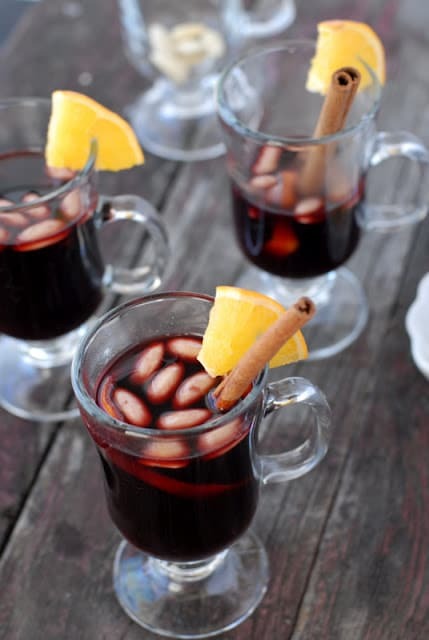 Mulled wine is a perfect drink for winter outings and holiday celebrating. When I found this recipe for Glogg, a Scandanavian mulled wine, in my Grandmother’s recipe box, I knew I had to share it with you! Great for après ski lounging or snuggled up by a home fire by the Christmas tree. 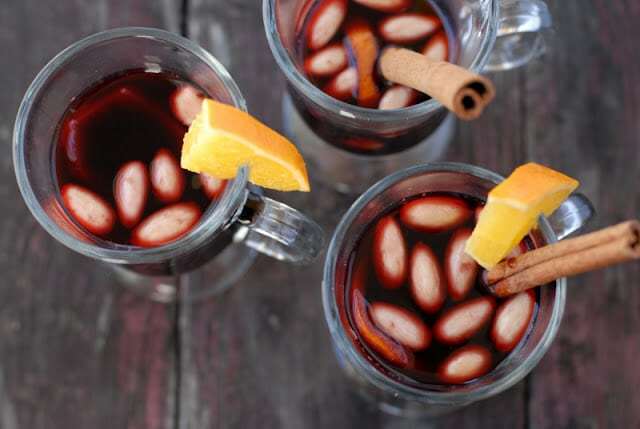 This festive hot wine is sure to warm the insides and the spirit. Maybe it’s from living in a wintery climate but hot cocktail drinks are really a favorite of mine when the snow begins to fall. Wine drinks have a warming quality that make for a cozy evening. The traditional mulling spices of cinnamon and allspice, also create a comforting depth of flavor. The original recipe suggests three possible wine varietals: Burgundy, Zinfandel or Gamay. I used an old vine Zinfandel that was fantastic. I will admit I was unclear on the role of the blanched almonds. They seemed an odd ingredient for a wine drink. 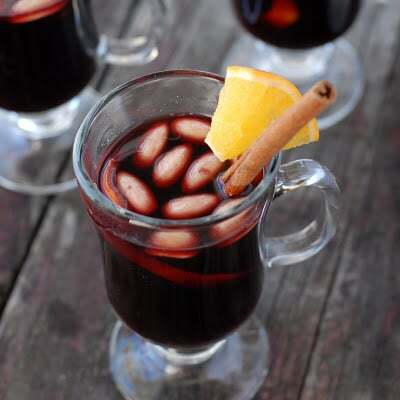 However, once having soaked in the mulled wine they become soft and fantastic, adding a very unique element to the drink. Also save the raisins and find something to do with them (Ice cream? Bread? Pie? 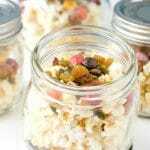 Boozy oatmeal? ); they are delicious. If you are keen on some warm wintery cocktails you will love this slow cooker hot buttered rum. As the name indicates, the base of the drink is a sweet, buttery liquid that is heaven. Since the rum is added by the serving, those wishing to bow out on the rum part may still enjoy to take the edge of winter’s chill (and can add rum extract instead of the real thing for the flavor and no alcohol). 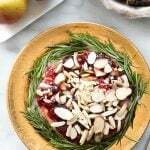 A fun idea for this Glogg recipe is to package up the makings for a hostess gift! 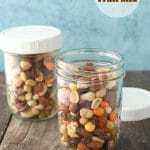 Combine dry ingredients in a jar or decorative bag, place in a basket with a bottle of suggested wine varietal, an orange, blanched almonds and the recipe for a ‘make it at home’ gift kit. 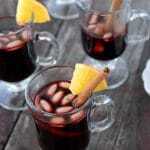 Mulled wine is infused with warming flavors for a comforting warm cocktail. Cut the peel from orange making one long thin strip. Squeeze juice from orange and place both peel and juice in a 2 quart saucepan. Add the sugar, raisins, cloves, cinnamon sticks, and wine. Heat over moderate heat until hot but not boiling. 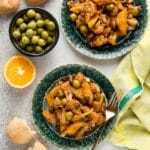 Allow to simmer 10-15 minutes, strain and serve in mugs with a few blanched almonds in each mug. We love to make Glogg after skiing! So easy and delicious.